The Steamship Authority needs to change its management culture or face more potentially dangerous disruptions in service, the leader of a five-month study of boat line operations told boat line governors Monday. “[The year] 2018 was not an anomaly,” said John Sainsbury, president of Seattle-based HMS Consulting who traveled to Falmouth to present the results of his firm’s independent review at a special public meeting Monday afternoon. 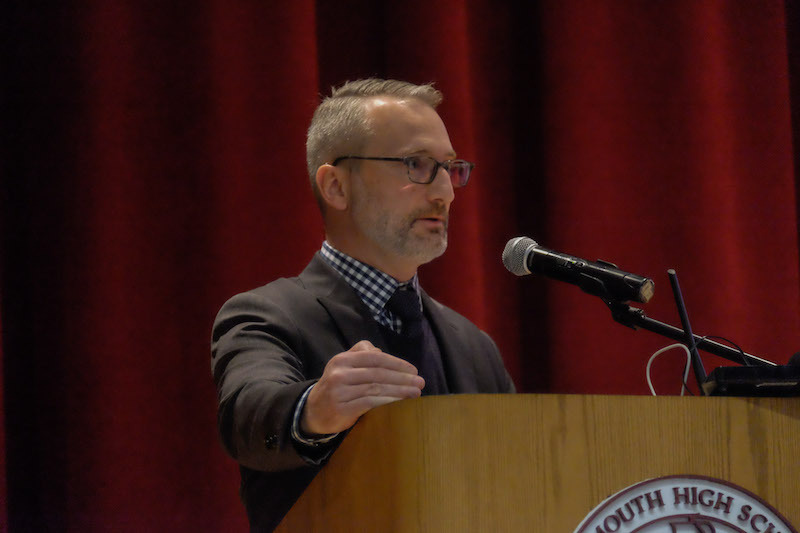 About 50 people, including SSA employees, two Falmouth selectmen and nearly a dozen reporters, turned out for the presentation in the Falmouth High School auditorium. Islanders were offered transportation from Woods Hole on a Steamship Authority bus, which returned to take them to a Vineyard-bound evening boat. About a half-dozen passengers took advantage of the ride. Commissioned after last spring’s unprecedented series of ferry breakdowns and service disruptions that led to hundreds of trip cancellations, the HMS report offers a rare and comprehensive view of the boat line’s inner workings. Assertions that these woes were just a “perfect storm” of coincidences don’t hold up to scrutiny, Mr. Sainsbury said. “I’m sorry to tell you that that’s not the case. That’s not the way it works,” he told the board of governors and audience. The HMS report makes 10 recommendations for change at the Steamship Authority. Each carries the potential for major improvement, but also the freight of implementation — a significant challenge for the SSA’s fiscally lean organization, but one Mr. Sainsbury said is essential to the boat line’s success. “I’m not sugar-coating it . . . These changes are not going to be easy,” Mr. Sainsbury said. Early in his presentation, he took issue with a Boston-area newspaper headline about the review. Speaking for nearly an hour, Mr. Sainsbury showed slides to help summarize his firm’s 140-page report, which analyzed four elements: vessel operations, fleet maintenance, management structure and information technology systems. Reporting on a fifth topic, public communications, was held up by personal problems affecting a subcontractor, Mr. Sainsbury said. A separate report on public communications will be made public in late January, he added. Four of the five boat line governors who attended the meeting made brief comments but mostly listened to the presentation. 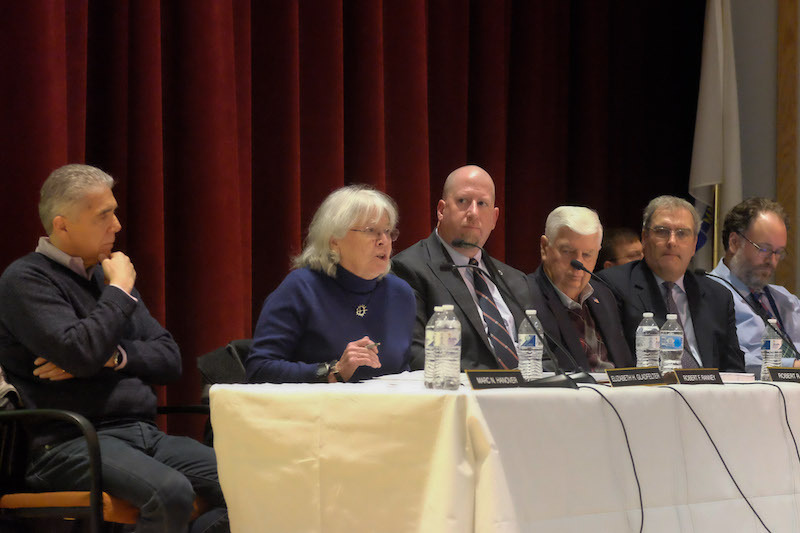 “I was not the least bit pleased [while reading the report] but after your calm presentation I am more pleased and susceptible to your suggestions than I was while reading the report,” Barnstable governor Robert Jones said. The report’s 10 recommendations are grouped into four areas. Under Process-Based Management, HMS recommends instituting systems for managing safety, quality and learning. The SSA needs to consolidate its procedures and information in all three of these areas, Mr. Sainsbury said. The boat line also needs a Vision, according to the report. This category recommends that the SSA develop a mission statement, with objectives, and a strategic plan. Under Organizational Structure, HMS recommends adding to the engineering staff, hiring a health, safety, quality and environment (HSQE) manager and reorganizing the vessel operations staff. The final area of recommendations, Management Recruiting and Accountability, advises adding performance objectives for SSA leaders and opening job recruitment to external candidates. “Focus on the long term, and you’ll fix the short-term items in the process,” he advised. Following Mr. Sainsbury’s report, governors opened the meeting to public comment. Falmouth selectman Sam Patterson, an engineer himself, took the microphone to endorse the recommendations. “I was with a company that adopted the ISO9000 standard for quality management and what I hear being described is really just a tailored version of that larger model,” Mr. Patterson said. It took his firm about two years to adopt the standard, Mr. Patterson said, but “we increased our productivity about 15 per cent,” while advancing quality as well. “Most of the major corporations in this country have gone through this process,” he added. It would be nice to get a summary of the full set of recommendations. What I see in this article isn't good. No "Vision", no "mission Statement", no "ISO9000 certification", no "recruitment of external candidates", no "objectives or strategic plan", no "performance measurement of management", the list is long and damming from the perspective of any "Public Company". The Board Of Governors is the the equivalent of a public company Board Of Directors, they have a fiduciary responsibility which they don't appear to be fulfilling. I would judge the Boston area newspaper was closer to the truth when they call it a "scathing report". There is an obvious leadership crisis, the events of last winter and spring prove this beyond any shadow of a doubt. We can choose to bury or heads in the sand or use some common sense and take serious corrective action, starting at the top. Culture change is hard, it only starts at the top. Says Marc Hanover, owner of an Island restaurant, to an outside expert: "I don't agree with all of it......" Well, Mr. Hanover, why don't you enlighten us with your knowledge that goes beyond what the experts say? Seriously, why is this restauranteur our representative on the SSA? Does competence count for anything? Let's start by making changes here. The SSA is a $100 million business. It needs to lead like one with a capable, respected board.